This Floral top! I promise this is the last floral thing I am wearing this week! I am running out of "floral" blog titles! LOL I can't make any promises about next week. But when I saw this shirt I had to have it. I love the bright colors and I love the bow in the front. Just another great Spring and Summer top. Ok can we talk about these Dittos jeans? This is my first pair of Dittos and I am obsessed. These jeans fit so well and are so flattering. Also they are really really soft and really comfortable. I am hooked on Dittos now and for the price of these ($70) I am so impressed. I am definitely going to be getting another pair of Dittos ASAP. Your top is gorgeous! I absolutely love your pink ring! Florals look amazing on you! Love that top and those jeans are perfect! OMG i love that floral top!!! The floral top is fun and ladylike. The jeans look stunning, I love the zipper detail. Girl, you are killing it lately! This outfit is gorgeous! I love the bright floral and those jeans are perfection - I love the wash and the zipper at the ankle! So cute! Gorgeous earrings and blouse! You always look so inspiring! Love this outfit!! I'm obsessed with florals this season as well! That is a great floral. Totally need it! I love that clutch, it's so pretty! Your outfit is precious, love reading your blog everyday! Always perfection! Love those jeans!!! Love the ankle zip jeans!!! Gorgeous look! Loving those bright blue sunglasses - they look amazing against your complexion and hair! The bold floral is great for spring and summer!! 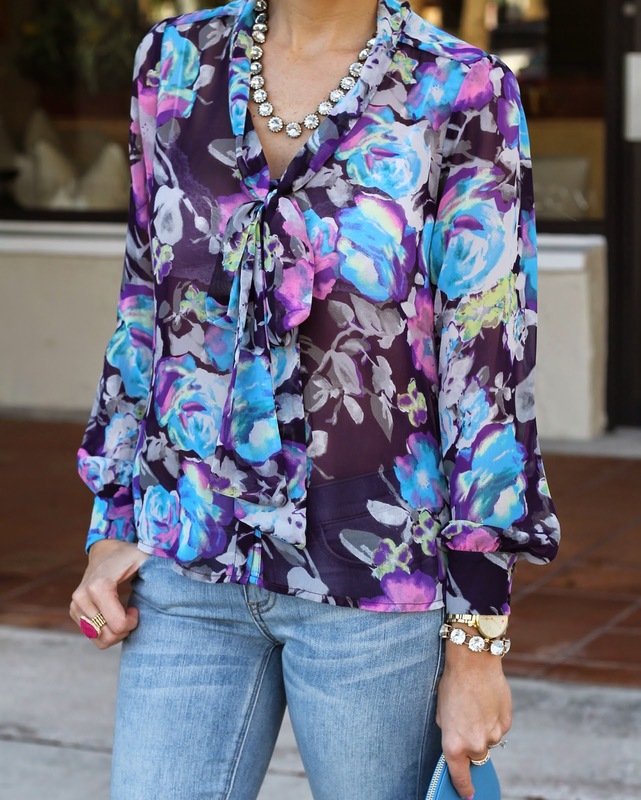 can't get over how gorgeous that floral blouse is!!! So pretty! Love the little zipper detail on the denim. i'm dying for this entire outfit! going to my nordstrom this weekend in search!! absolutely love your blog!